I wouldnt normally list a cheap dashcam and wouldnt normally buy one but having seen this for £10.69 shipped within the EU I thought it might be ideal just as a rear dashcam which is what I will be using it for as already have a decent front one. I also have a large after market rear view mirror so will replace it with this plus it can be used as a reverse camera. Ok its gearbest but price wise its not bad. A few other places have it for around £30. Spec etc in my next post. Gearbest hmmmm!I've just received an IP camera I ordered from them 10 …Gearbest hmmmm!I've just received an IP camera I ordered from them 10 weeks ago! And?..... Bet you paid at least 100% cheaper than anywhere else in the UK and got it delivered for peanuts.... Or more likely free.... all the way from China. 170° Full HD 1080P 4.3" TFT LCD Video Recorder Dash Cam Dual Lens backup Rearview Mirror Car Camera DVR Digital Video Recorder Night Vision DescriptionThe dual lens camera with 1080P resolution,can record clearer video in the before and after of your car! This dual lens dash camera is mounted to the rearview mirror of your car easily. angle allows you to adjust the camera angle easily in real-time, and back lens to ensure the rear safety! Features1. 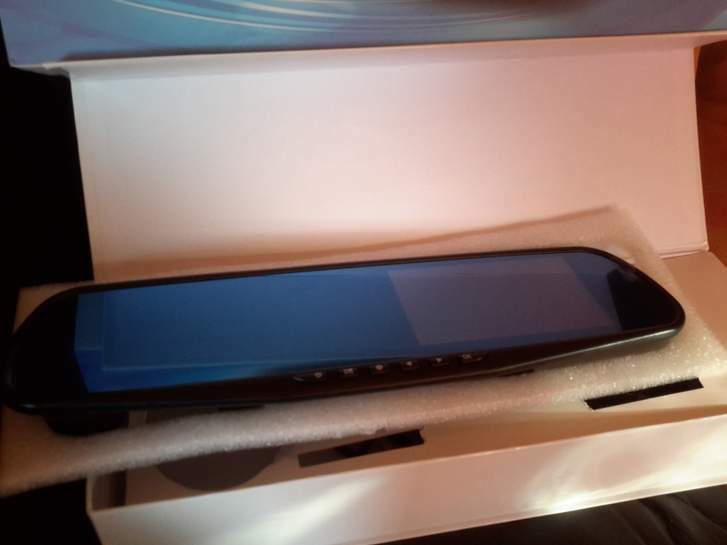 4.3” TFT HD screen, Anti-glare blue mirror. 2. This product is HD camera which is designed with the latest technology. 3. It is a common HD camera and a professional HD car DVR that the file resolution can up to 1920*1080P. 4. Support G-sensor, impact sensitivity adjustment automatically lock file. 5. It also can take pictures by using TF card to be the memory equipment. 6. It can record the HD videos and more specific images. 7. 170 degree Ultra High-definition wide angle lens, flexible front lens. 8. 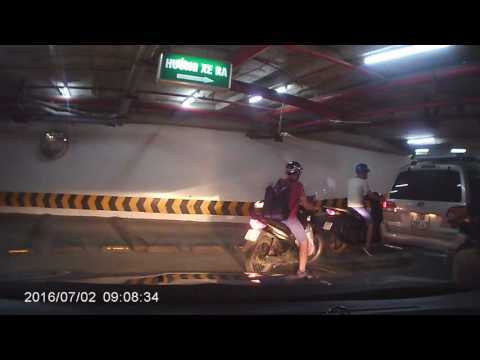 With backup rearview camera, can shooting the car’s rear without blind area. 9. In the recording mode, if you want to protect the current video will not be overwritten, press “Menu” key to activate the emergency lock function. 10. Easy to install by the two soft brackets. 11. 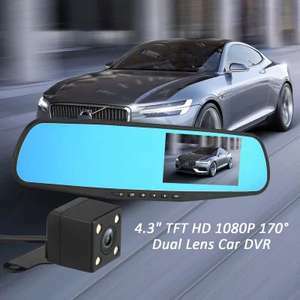 Works just like a regular rear-view mirror, and has a Full HD 1080P camera recording everything in the road ahead and help you reversing with rear view camera. Note: This device is used for driving daily use, built-in battery only for shutdown file settings, battery life is limited, please connect the car power with daily use. Edit, updated link works, cheers op ordered. I've just received an IP camera I ordered from them 10 weeks ago! 170°? About 90° in real. Chinese measurement for uneducated people. From what I saw on the reviews, image quality is very average...I order one anyway I'm thinking installing it pointing in the direction of wing's mirror view, checking the blind spot.. Still available - I ordered one just now for £10.69. Thanks for sharing - heat added. Regarding the rear view camera.... is it wireless? Also, how is it powered? Thanks for the info guys...seems a great product for a tenner!! 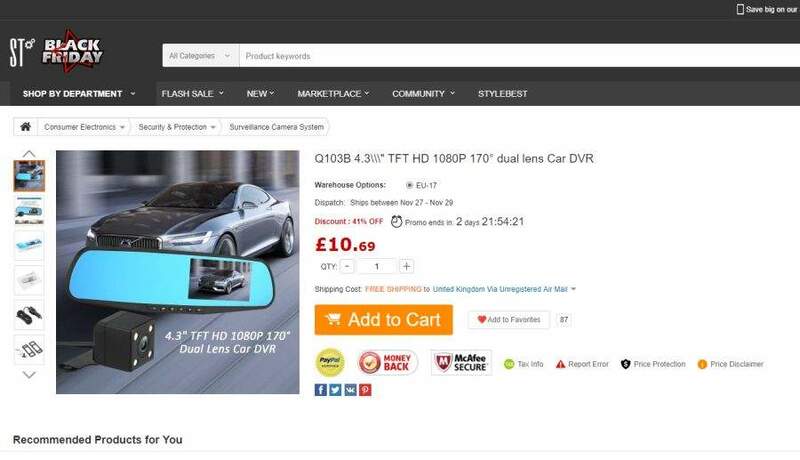 For those wondering, the rear view camera isn't wireless and nor does there seem to be a way of triggering it automatically when you go in reverse, but at this price you can't complain! Defo worth having even if you were to use it as a regular front facing dash cam! Thanks for the info guys...seems a great product for a tenner! !For those …Thanks for the info guys...seems a great product for a tenner! !For those wondering, the rear view camera isn't wireless and nor does there seem to be a way of triggering it automatically when you go in reverse, but at this price you can't complain!Defo worth having even if you were to use it as a regular front facing dash cam! I always go with free delivery - nothing took more than 3-4 weeks to arrive in nearly 5 years. Free delivery also means that 99% chance that you won't get stung by customs/duty. You're right though, if you order from China, one shouldn't expect a quick delivery. 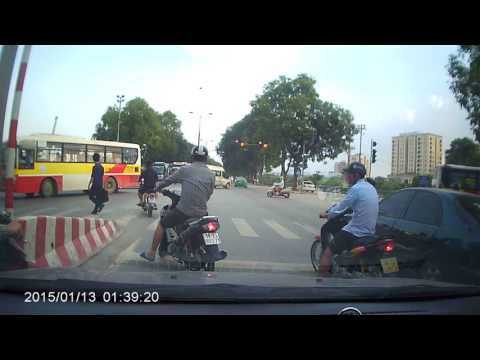 Coming up as "insufficient stock"
I used a similar dashcam/mirror. It was not good as a rear view mirror. Blue tint confuses you. But they lie about how long it will take to arrive? still can be found on ebay around the same cost. wow, only ordered this Sunday and it arrived today, now thats better than Amazon! Just got it out of the box and it looks good too! 2.8" is not really same as 4.3" ? Whilst mine arrived smashed - I would definitely put it to the stupidity of Hermes drivers. "ooh look, a Car DVR, over the fence with you!"